UNC Greensboro Athletics today announced the Campaign for Champions, a fundraising campaign to transform student-athlete academic and support facilities, and to recruit and retain top coaches to lead UNCG’s 17 Division I athletic teams. 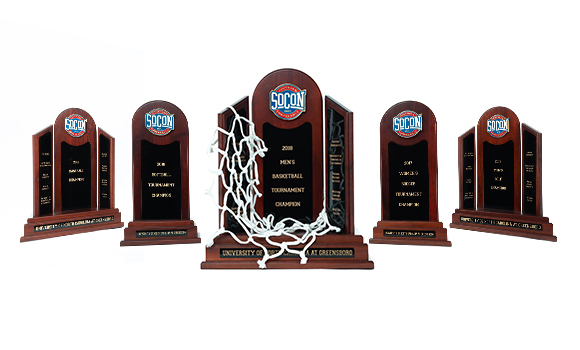 The campaign’s first initiative – 5 for 5 – aims to raise $5 million by June of 2020 in recognition of the five Southern Conference Championships won by UNCG athletic teams during the 2017-18 academic year. To date, the campaign has nearly $700,000 in commitments. The remaining $3 million will support the sustaining success endowment that will provide a consistent fund source to invest in UNCG coaches. The Campaign for Champions, led by co-chairs Vanessa Carroll ’83, George Hoyle ’90, and Kathleen Kelly, is a vital part of the overall, comprehensive University Campaign that is currently being planned. Success and growth for UNCG Athletics have mirrored the overall growth of the institution. Over the past year, UNCG has arrived at what Chancellor Franklin D. Gilliam, Jr. calls an “inflection point.” UNCG graduated the largest-ever class in May, enrollment surpassed 20,000 students in the fall, and the University has been recognized in national ranking lists for academic excellence and its student success efforts. To learn more about the Campaign for Champions, visit uncgcampaignforchampions.com.